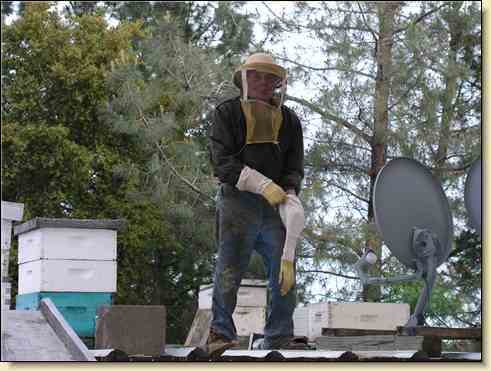 An entire month has already passed since my dad broke his hip while harvesting honey from his rooftop beehives. 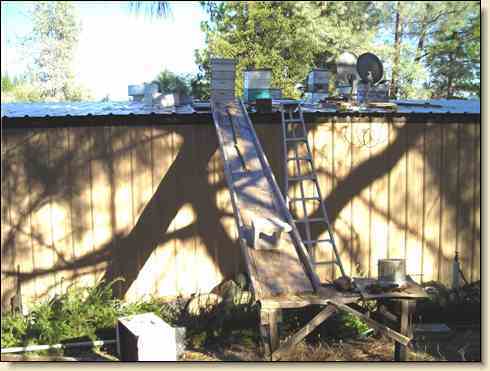 He keeps the hives on the shed roof so the bears won't get into them, which had been a major problem. 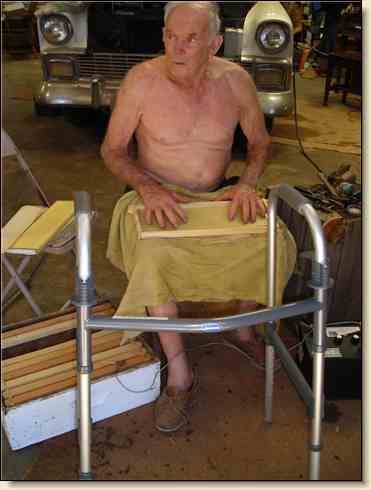 When I got word on Sunday evening, July 16 about my dad's injury, I figured he'd fallen off the ladder or something. But he made it down the ladder just fine with bee frames and a bucket of honey. Ironically, he tripped & fell hard as he entered the house with his honey - up one easy step! Since my mom can't see to drive safely at night, and my van was not working, my dad drove himself to the Mather V.A. Hospital more than an hour away at 2:00 a.m. when the pain became unbearable. He didn't want to bother the neighbors, even though many would have been more than willing to take him. 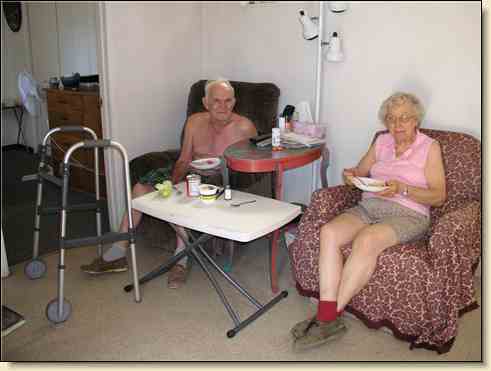 Emergency room tests showed a hip fracture, and he was taken on to Fort Miley V.A. Hospital in San Francisco for surgery on July 18 - his 86th birthday. 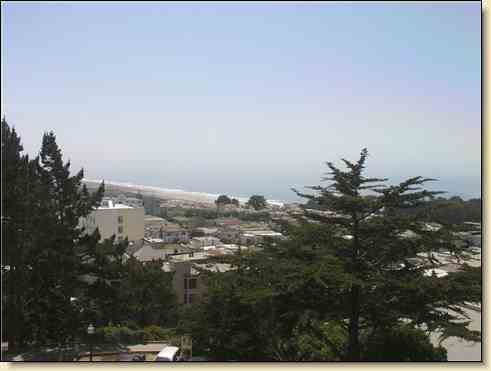 The ocean view from his hospital room was nice. But what a way to celebrate his birthday! My sister Linda Adams flew up from southern California to be with him. 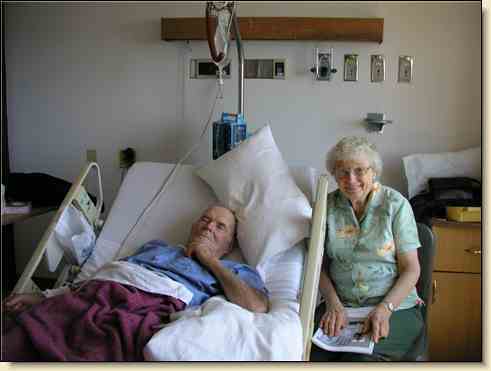 Being an emergency room physician for the past 19 years, she wanted to be sure our dad was well cared-for. She's flown or driven up to be with our parents every weekend since then - a round trip of nearly 1,000 miles. By Friday July 21 my dad was eager to get out of the hospital and back home again. 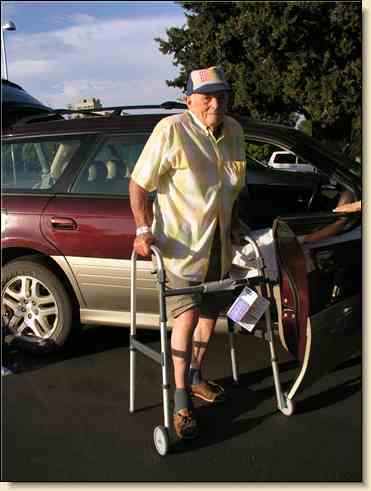 Using a walker and putting very light pressure on his right leg, he's been able to get around. He has 4 screws holding his hip together. He needs to "tread lightly" for 6 weeks from the surgery date. My parents stayed in Daniel's room at our home because of the record-breaking heat. We had 12 days in a row above 100 degrees, and their home has no air conditioning. My sister Lanita Medina flew all the way from her home in Maine to spend some time here. She brought Conchita, a Mexican student who had been helping her during the summer, to be with our parents and help wherever needed. They cleaned our parents' home thoroughly before letting them move back in. 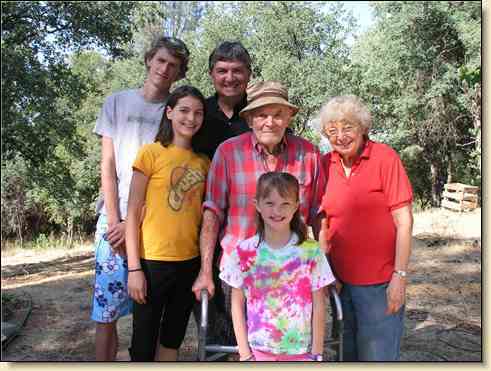 A few days later, Lanita's husband Norman and 3 of their kids - Ben, Krista and KK came to visit as well. Oldest daughter was working at Summer Camp and couldn't come. 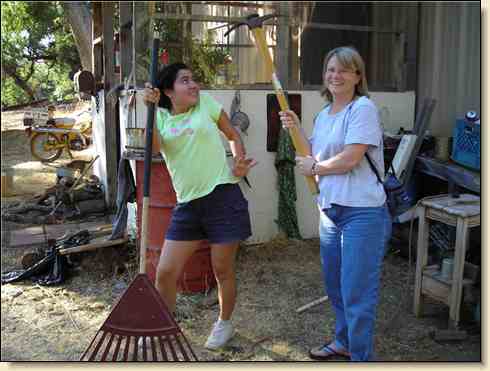 While tidying up the yard and picking up obstacles at our parents' place, Linda made sure Conchita did her assigned tasks - or else! As soon as the house was clean and the weather cooled down, my parents were back in their own home - on the next ridge over from our house. There's no place like home! Right away my dad wanted to get out and check on the garden. 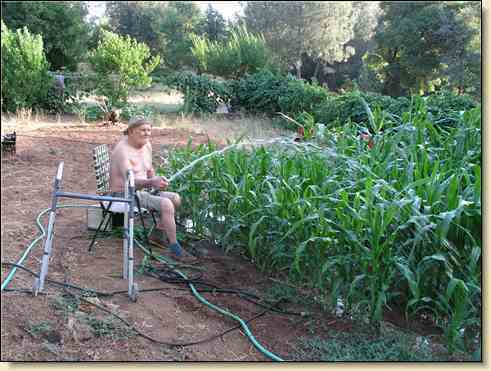 Only 5 days after his surgery, he was out there watering the corn. Whenever nurses or therapists would come to visit, he'd come to our place, have my mom clean the dirt of his walker, and lie on the bed or sit on the sofa. They'd walk him slowly around the house, warning him to be careful about obstacles and uneven places. As soon as they left, he'd be back in his garden again - forget those hoses, dirt clods and everything else the therapists don't know about! Nothing is going to hold HIM back! 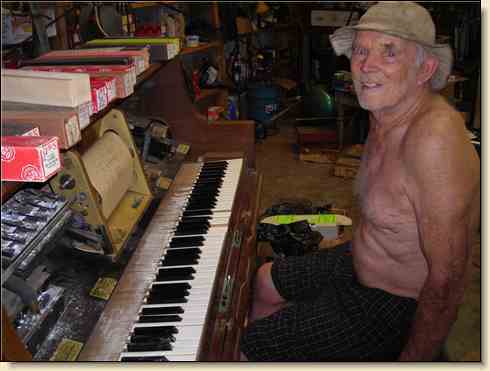 When he needs a break, my dad has fun with the "new" toy he acquired last year - an old player piano. He also plays some songs he knows and really enjoys doing it. And he had to get more frames ready for the beehives, though we don't know yet who will be able to get up on the roof and put them in the hives! 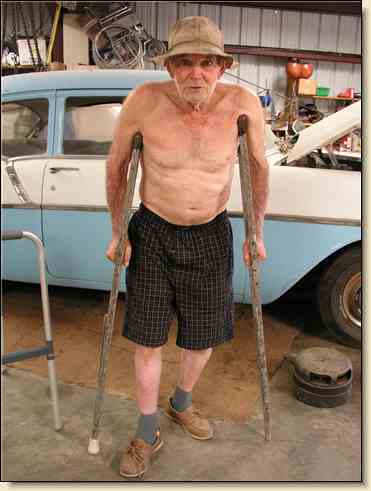 Tired of his walker, he pulled out his old cruthes - ones he got new 42 years ago when he broke his leg in a logging accident. They're in pretty bad shape after sitting outdoors a long time! 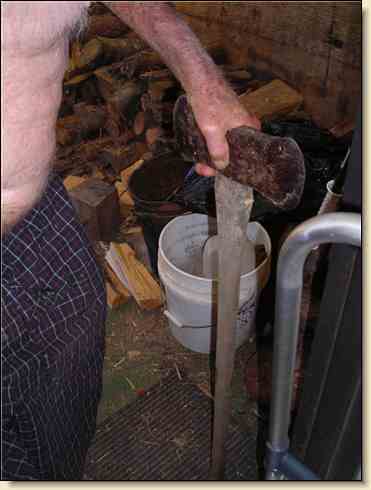 Sometimes he grabs an old axe and hops on one leg to get around in places his walker won't fit. Then he came up with a quicker mode of transportation. 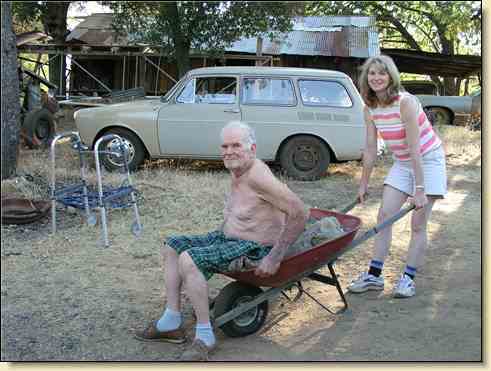 He had Lanita put an old sleeping bag in the wheelbarrow so he could get around further & faster. He also fixed up our garden wagon "limo" for getting around his uneven property. 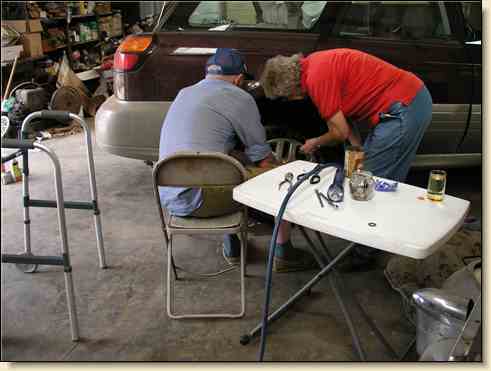 When vehicles need repair, he gets right in there, telling my mom or a helper what to do. 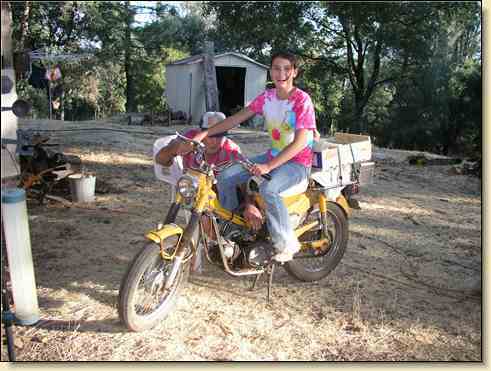 He got our old Honda 90 running again, and 13-year-old granddaughter Krista Medina is trying it out. 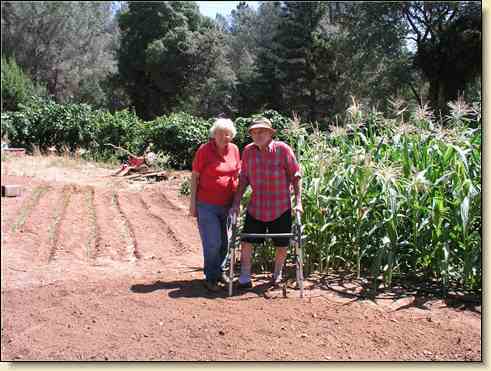 My parents spend a lot of time out in the garden, taking care of corn patches, beans, tomatoes, squash, and more. The grapes are ripening as well. There's always plenty of watering, weeding and harvesting to do! And more corn to plant! Here he is in the middle of the corn patch with his walker, holding a machete and an ear of half-eaten corn in one hand and another ear of corn in his pocket. 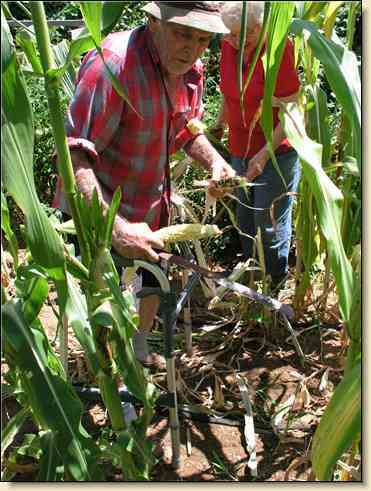 After picking the corn, he uses the machete to chop his way through the harvested area and get back out of the patch. If only the nurses & therapists knew! Obstacles? Yes, he's being careful - as much as possible in this particular location! My dad's really grateful for a devoted, loving wife. 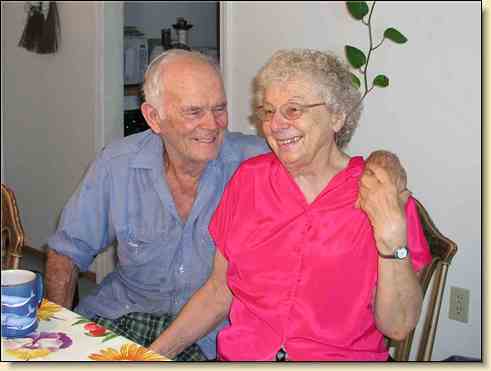 She takes good care of him and does everything else around the house & yard, now that Conchita has returned to school. And my parents are grateful for their wonderful kids & caring neighbors who will do whatever they can to see my dad back to full recovery. And thanks to each one of you for your thoughts, prayers and notes of encouragement.